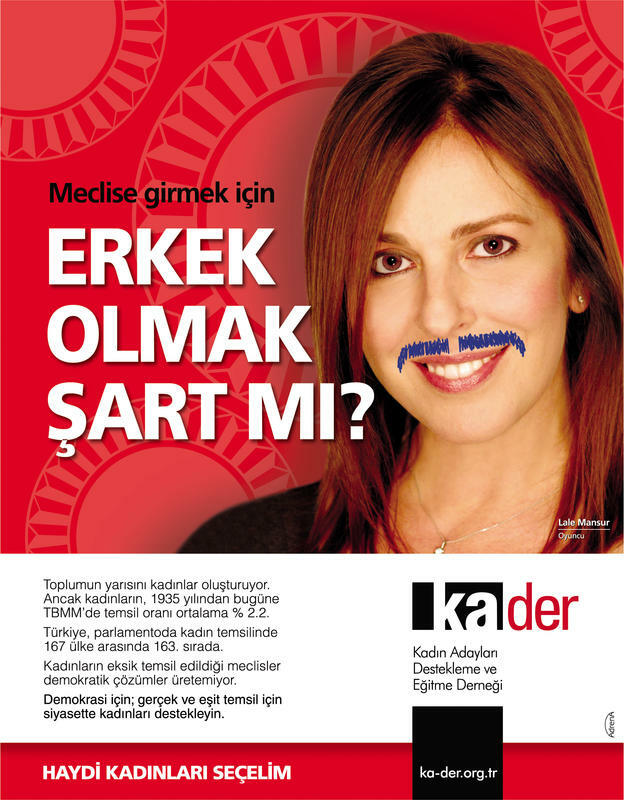 Kader Sevinc: EU and Turkish women: What do numbers say? What does EU do ? No country can be competitive economically and credible democratically without highest standarts of gender equality. The Turkey’s civilisational roots and aspirations to live in an advanced information society and democracy in the 21st Century justify the highest political focus on gender equality. This is why the Turkish government, parliament and all the political parties have an ever more important responsibility to improve Turkish society’s performance on gender equality to above the European average. With abiding faith in the vital importance of women in society, Ataturk launched many reforms to give Turkish women equal rights and opportunities. The new Civil Code, adopted in 1926, abolished polygamy and recognized the equal rights of women in divorce, custody, and inheritance. The entire educational system from the grade school to the university became coeducational. 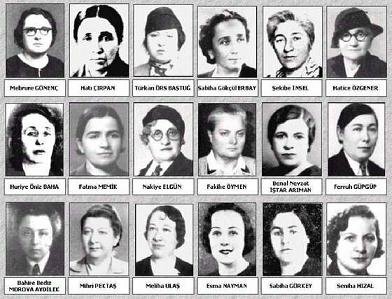 Ataturk greatly admired the support that the national liberation struggle received from women and praised their many contributions: ” In Turkish society, women have not lagged behind men in science, scholarship, and culture. Perhaps they have even gone further ahead.” He gave women the same opportunities as men, including full political rights. In the mid-1930s, 18 women, among them a villager, were elected to the national parliament. Later, Turkey had the world’s first women supreme court justice. Recognition of equal rights of men and women (1926 – 1934). The legal position of women and their place in society in the new republic was greatly improved (for example the active and passive voting right at national and local elections). The liberation of the women of Turkey by giving them political and social rights. In 2010, women protested PM Erdoğan at the International Women’s Istanbul Meeting for having said that “men and women are not equal”. Pointing to women murders they said, “”More of us are being killed when you say we are not equal”. In the year of 2011 Prime Minister Recep Tayyip Erdoğan said: “We are a conservative democratic party. The family is important to us” and he announced in the same breath to replace the Ministry of Women and Family Affairs by the newly established Ministry of Family and Social Policies. This decision came despite massive protest of women organizations and a signature campaign with 3,000 participants submitted to the prime ministry on 6 June. According to the statement, a number of institutions will be deployed under the roof of the new ministry, i.e. the General Directorate of the Status of Women (KSGM), the General Directorates of Family and Social Services, of Children Services, of Services for Disabled and the Elderly and of Social Aid. Furthermore, the Head Department of Veterans and Families of People who Died while Serving the Turkish State will be established within the structure of the ministry in order to closely follow the problems of the two aforementioned groups. Critics put forward that this application opposes international agreements signed by Turkey and also the legal acquis of the European Union (EU). This view was advanced by Hülya Gülbahar from the Platform for Equality Mechanisms, Dr Selma Acuner from the Ankara University Research Centre for Women’s Issues (KASAUM) and Çiğdem Aydın, Board President of the Association for Support and Education for Women Candidates (KA.DER). The international agreements signed by the Turkish government render Turkey responsible to pursue policies that strengthen gender equality in order to end violence and discrimination against women. By removing the Ministry of Women and Family Affairs and including the KSGM into the structure of the Ministry of Family and Social Policies, the mechanism for ensuring gender equality is being eliminated. It means that women are not being positioned as individuals but as an element of the family instead. Emma Sinclair Webb, Turkey Researcher at Human Rights Watch (HRW), expressed her concern about the application. “This is a very risky step to take in a country where violence against women is that common”, she said. “The European Women Lobby initiated a related campaign in cooperation with approximately 4,000 organizations. The campaign will quickly spread all over the globe”. “According to the decisions of the European Court of Human Rights (ECHR), it cannot be seen that violence against women stems from problems within the family. The decisions of the international court underline that violence against women is an indicator of human rights violations, discrimination and inequality of men and women. At least five women are killed in Turkey every day. Nevertheless, the women’s ministry is being lifted. This heralds the end of state policies related to gender equality”, Gülbahar said. She continued: “Violence against women is not only experienced within the family. Discrimination in political representation and participation and sexual harassment at work are also forms of violence. Gülbahar indicated that a state and an organization that abandon the generation of solutions and politics in this field constitute a clear breach of all the international agreements signed by Turkey”. “On 7 April in Strasbourg, the Council of Europe Committee of Ministers chaired by Turkey approved the new Council of Europe Convention on preventing and combating violence against women and domestic violence. Turkey was the first country to sign the convention on 11 May in Istanbul” Acuner reminded. “The crucial point of the convention is the fact that violence and discrimination against women is defined as a ‘human rights violation’. The convention read, ‘Violence in a country is the result of inequality of men and women in that country’”. “One of the texts this agreement was constituted upon was the conviction of Turkey by the ECHR in the case of Nahide Opuz. Turkey was convicted because of the failure to protect Nahide Opuz from violence and because of a lack of effective measures for the prevention of discrimination. It was announced in the decision that Turkey needed to work on abolishing inequality and strengthening women policies”, Acuner remarked. “The establishment of the Ministry of Family and Social Affairs is an indicator for abolishing women policies. The KSGM is the only official mechanism in charge of making policies to strengthen gender equality. It now becomes an ineffective unit without authority under the new ministry as a result of the application. After this , it will be very difficult to access sufficient monetary and human recourses to carry out efficient work. This means that women policies are being erased from the state’s agenda”. * According to the standards of the European Union (EU), one women’s shelter should be opened per 7,500 people. Hence, there should be 7,500 shelters in Turkey, but in reality there are 38. They have a total capacity of 867 people. * In the Gender Equality report of the World Economic Forum Turkey ranks in 122thposition among a total of 135 countries. * The number of women murders increased by 1,400 percent within the past seven years. There is no action plan to stop this development. In fact, the legislature and the executive do not even have an according agenda. – Turkey’s rank in women representation in parliament (% 14.2) is 88th among 143 countries. – In the world there are only 9 countries which has women representation in parliaments at the level of 40 percent. – Women representation rates in cabinet, Turkey ranks 90th among 96 countries by one minister in charge of family policies. 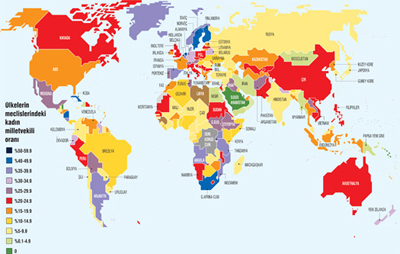 – There are women heads of state in 17 countries in the world, only 8 countries have woman prime minister. The current Turkish government has proposed and implemented several projects whose official target is the improvement of the gender equality in Turkey. PM Erdoğan had also appointed a woman as Minister of Education. Many Turkish women still expect this government to reverse the actual negative trends. Moreover independently from any narrow political context in Ankara, the Turkish women and the NGOs throughout the country are firmly committed to raise Turkey’s gender equality standards to the level of best performing countries in the world. All surveys underline that Turkish women are staunch supporters of the EU membership, more than men. They are the major supporters of accession. So the question is : Does the EU sincerely support Turkish women with all its power today ? This question still needs to be answered.